You’ve constructed a beautiful looking and perfectly round pizza but now fear strikes you as it’s time to transport this work of art to the pizza oven. This seemingly insignificant part of the pizza making process is where disaster is most likely to occur. When I see someone trying it for the first time I picture a child attempting the magic trick of pulling the tablecloth from a laid out table without breaking a single item. You just know it’s going to end in tears. But you can eliminate this inevitable disaster using a pizza peel and I’m going to tell you what’s the best pizza peel along with a guide to know a good peeler from a bad one and whether it’s better to buy a wood pizza peel or a metal one. All three of the peels in our best pizza peel list are made by the same company – GI Metal. They are all pretty expensive and might be out of most people’s price range. You do have other options that I’ll explore later, but as the topic of this article is best pizza peels I’ll only add the best to the list. Also, if you followed our advice on our best pizza oven page, the winning oven came with a really great pizza peel, unfortunately they aren’t sold separately at the moment. What makes one pizza peel better than another? For a piece of equipment that is pretty basic in what can be done with it, it’s surprising that the vast majority of peelers are actually pretty poorly made. It seems manufacturers believe all they have to do is stick a handle on a circular piece of wood to be able to claim they have made a great pizza peel. This simply isn’t the case. A good pizza peel should be extremely thin, preferably with tapered edges, and made from a strong material. This is so the peel can easily slip under the pizza. If the pizza peel is chunky then you’ll have to lift the pizza onto the peel – kind of defeating the point of having one. The peels head should also be perforated. These small holes allow the excess flour to fall off before the pizza reaches the oven or pizza stone. And the handle should be a decent length, not a stubby little hands length, and it shouldn’t pass heat up to the user’s hand. This is normally achieved by using a different material or by adding grips. Now you know what makes a good pizza peel have a quick google and see how many you can find – there aren’t many. This is why our list of the best pizza peels is so small. It’s not that there aren’t lots of peels on the market, there are thousands, it’s just most of them are no better than using your cutting board. If you’ve looked at the top 3 pizza peels I’ve recommended you’ll know that I think metal peels are far better. What is surprising is that many of the other articles I read, the authors show a preference for wooden pizza peels. The reasons are often nonsensical to me as they have nothing to do with making pizza, and more to do with style or nostalgia. 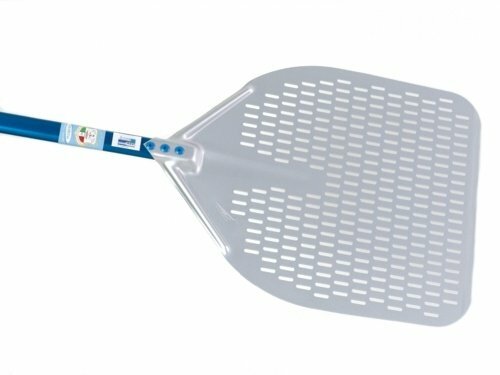 A good pizza peel is used to help make great pizza, not make you look cool or be used as a visual aide to reminisce about the good old days. Nonetheless, some people are clearly more interested in having a wooden pizza peel than a metal one. So what should you know about wooden peels? For a start they’re much cheaper, and let’s not pretend, this is a massive plus point. And although I have clearly stated my preference for metal, either stainless steel or aluminium, I do own a couple of “wooden pizza peels”. Why have I added “wooden pizza peel” in inverted commas? Because I never really use them as pizza peels. I may prepare pizza on it before using my metal peel to transport the pizza to the oven, but mostly I use them as a stylish way of serving pizza (I also think they are great for displaying a cheese board or meat platter). So for this reason I’d recommend a wooden pizza peel. One issue you have to be aware of with wooden peels is that they aren’t as durable as metal peels and will need some care and attention. Wood warps if left wet, so after use you’ll have to clean and dry them – you can’t leave this job till the morning. Also wood is porous, so they are more susceptible to staining and unpleasant smells soaking deep into the wood. This means if you buy a wooden peel, you’ll likely have to replace it far more often than a metal one, negating the “I’m buying a wood peel because it’s cheaper” reason. If you’re using your BBQ grill or kamado as a pizza oven then a pizza peel isn’t as important. You’ll not need something with a decent sized handle as you’ll not be putting your hand into a baking hot oven. 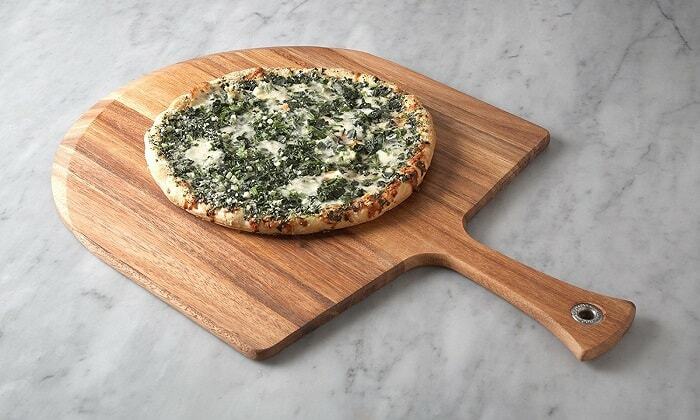 So you can basically prepare your pizza on any portable flat surface and slide it onto your pizza stone. But if this is your plan I’d recommend buying some parchment paper to do the initial transfer, this will eliminate any risk of the pizza sticking to the surface. I’ve recommended using parchment paper to stop your pizza sticking to a makeshift pizza peal, but you’ll see lots of hacks suggested for this task; cornmeal, semolina and oil are just a few. Unfortunately, adding any of these ingredients will also slightly alter the taste of your pizza, so should be avoided if possible.